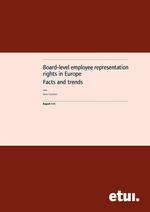 17 European Member States and Norway have enacted legal provisions allowing for employee representation, with voting rights, on the supervisory board and/or board of directors of companies headquartered on their national territory. Additional provisions regulating Board-level employee representation [BLER] are to be found in several pieces of European company law. Even so, BLER remains a hotly debated topic at both national and European levels.